Aiming to improve broker retention through more profitable traders is PsyQuation and its "journey" for becoming better traders. It’s no secret that the vast majority of online retail forex traders lose money. Within our quarterly profitability report of US brokers, on average, about 35% of retail traders in the US make money each quarter, with lifetime success estimated to be below 30%. While brokers in other jurisdictions don’t post profitability statistics, based on interviews with various brokers, worldwide profitability for regulated retail brokers is believed to be around 25%. However, multiple brokers have cited that larger accounts (over $10,000) significantly perform better than smaller sized accounts. With this reality, a number of firms have been creating solutions to help traders have a higher chance for success. Products include solutions that conduct behavioral analysis to review when and how a trader does their best and worst and send notifications when they are placing trades that have historically performed poorly. In addition is an array of education and risk management tools to help traders better understand the market and applicable risks. Soon launching to provide a new solution for the retail lack of profitability problem is PsyQuation. Based in Australia, the firm was founded by company CEO Michael Berman and CTO Vladamir Krouglov Ph.D who prior to creating PsyQuation had worked together on a product to help incubate traders for money management funds. Speaking to Finance Magnates, Berman explained that the roots of PsyQuation was based on the theory that brokers can increase customer lifetime values and retention rates through having more profitable traders. In their previous work, Berman and Krouglov had built an algorithm to score traders and allow them to discover which are the most skilled and most likely to succeed in the future. However, Berman explained that the problem with any trader rankings is that less skilled traders fall to the bottom, and their “score is less useful” when calculating expected results for the future. As a solution, Berman cited that when building PsyQuation the goal was a product that could both monitor new traders, but also discover ways to improve their success. To do this, Berman stated that the PsyQuation’s angle is “less is more”. He explained that to do this, they removed many of the statistical calculations that are used to calculate risk such as sharp ratios, and focus on whether a customer is trading in a way to achieve their goals. To simplify the process, upon registering to PsyQuation, users enter their annualized profit target and maximum acceptable loss. Based on these goals, the PsyQuation platform reviews whether a trader’s habits are within their risk goals. Among items then reviewed is customer leverage, whether trades are taking place during news periods, position sizes and behavioral factors such as overconfidence and loss aversion. PsyQuation also creates a real time VaR (value at risk) score that displays how much a trader is currently risking if all trades go against them. 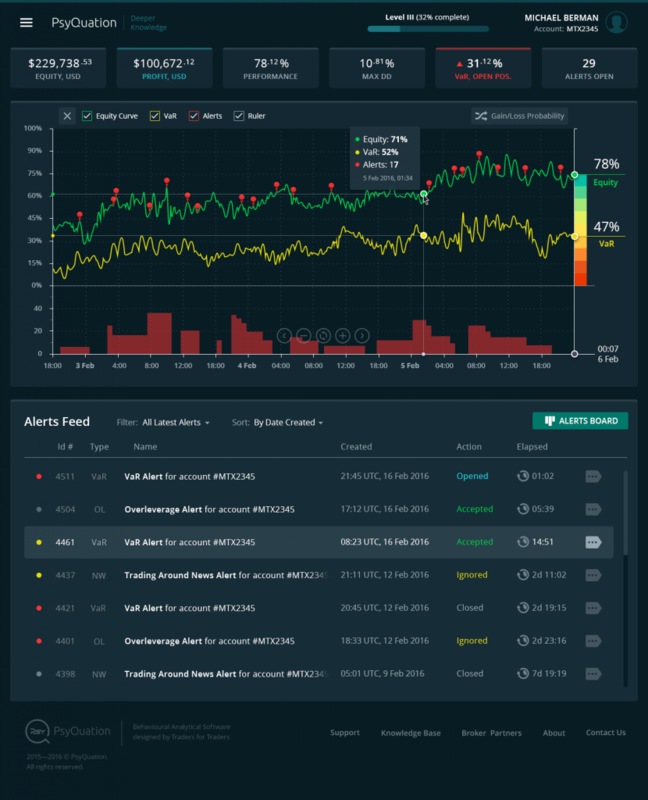 In addition to the dashboard which shows current risk and performance as related to a customer’s goals, the system also sends notification popups when fundamental and behavioral alerts are triggered. Beyond the real time view, the platform includes the “PsyQuation Journey”. Providing longer term performance analysis, this page allows customers to view how their trading is matching to their desired goals. Berman explained that PsyQuation uses an algorithm to track how a customer is adhering to the trading alerts which were created to help them meet their profit goals. Overall, According to Berman, the end goal for traders that emerge from PsyQuation isn’t a system that leads to finite profit amount, but one that will make them better traders for longer lasting success.